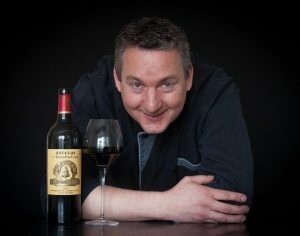 It’s National Wine Day so I would like to share with you some of my favourite French wines. While three areas of France, Champagne, Burgundy and Bordeaux, enjoy worldwide recognition because their historic tradition for fine wines, there is wine production in most French regions. In general while, the northern vineyards are known for their white wines, the southern vineyards, from Burgundy southwards have a reputation built on their red wines. As a family, we like to return to France as often as we can and a trip isn’t complete without a tour of some of the smaller vineyards, offering wine that very much is a taste of the region in which they are produced. The Burgundy region (where monasteries played a key role in developing the wine industry) produces my all-time favourite wines and below are some of the wines I always buy direct from the producers when I have the opportunity. There are a large choice of reds and whites under this name and they are all very affordable. The whites are delicious served for pre-drinks with canapés. Champagne is used for any celebration in France, a bit like Prosecco in the UK. I know the owner of this vineyard personally as some close friends have a countryside house next to the vineyard. He is very nice and produces champagne that is genuinely “terroir”. This is very good quality of Champagne, and at a nice affordable price of 12 euros. This one is my favourite wines and I have never been disappointed. It is at its best when served with game. What a lovely discovery – this was recommended by my friends who live in this area of France. This wine is very good with shellfish. These wines are available online, although some may not be available right now. 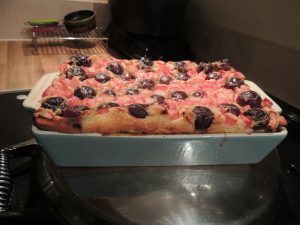 Celebrate World Baking Day with your loved ones and bake them my delicious Cherry & Rhubarb Clafoutis. Fraisier is a classic French cake found in most pâtisserie shops. 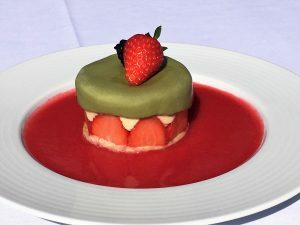 Follow the steps carefully to produce a delicious strawberry, summery tasting dessert that is sure to impress your guests. Add the eggs and caster sugar in a bowl and mix together with an electric mixer on full speed for 10 minutes. Add the plain flour and gently stir. Melt the butter before adding it to the mixture. Spread the sponge mixture evenly on a greased rectangle baking tray, 45x30cm and bake in the oven for 12 minutes at 180°C. Once baked, remove the sponge from the tray and let it cool. Add the milk and the pistachio paste to a large saucepan and leave to heat gently. In a bowl, mix the three eggs, two egg yolks and caster sugar. Add the flour and mix again. Add the mixture to the saucepan with the milk, mix well and cook over a low heat. Bring it to the boil for a few minutes whilst whisking. Put the cream to one side and cool until lukewarm. Put the gelatine leaves in cold water to soften them. Cut the butter into small pieces and gradually mix it into the cream. Drain the gelatine leaves and put them in a saucepan with 5cl of water to melt them. Add the gelatine to the cream and mix. Incorporate the whipped cream and mix well again. Leave to one side. Use the cutter to slice your Genoese sponge into two round shapes. Leave one round Genoese at the bottom of the cutter. Mix the kirsch and syrup and soak the sponge. Cut the strawberries in half and arrange them along the inside of the cutter before filling the inside with the rest of the strawberries. Pour the mousseline cream on top of the strawberries and smooth with a spatula. Lay the second round Genoese on top. Cover with 2mm of thick marzipan. Refrigerate for 24 hours and remove the cutter to serve.